The Lion’s Song is a game, which in many ways, you can only loosely call a ‘game’. It’s very much a narrative-driven experience that has small amounts of user input to make the story your own. The main hook are the four stories (or episodes as they are referred to in the game). 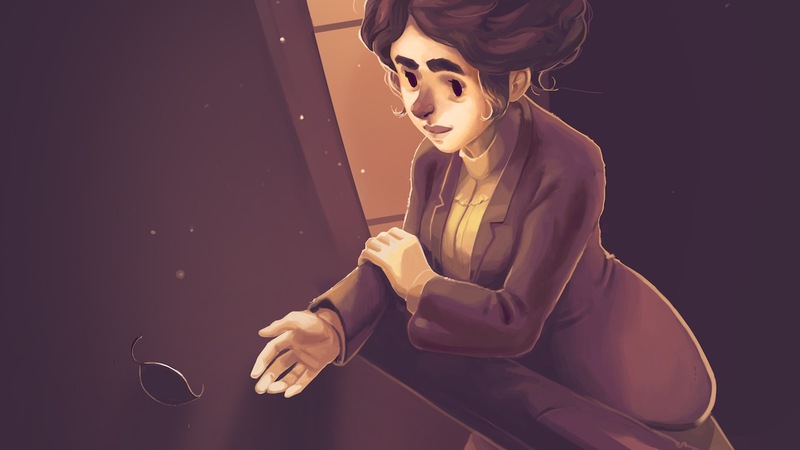 Set in early 20th century Austria, each of the stories are genuinely touching and may resonate with you in some way, as each of the four playable characters are all struggling with something different in their lives, and it touches on subjects such as sexism and mental health issues. In episode one, Silence, you take the role of Wilma, a gifted violinist who is tasked with creating a piece of brilliant music for a concert. Feeling the pressure surrounding her, she is unable to find the inspiration needed to create a piece good enough, in her own mind. In addition to this, to further add to the fuel, she has developed strong feelings for her teacher which make things that much more difficult for her. He offers to let her stay at his cabin, where she can be free from interruptions, distractions and just about every other person in the world, but she only seems to take him up on the offer because she feels she has to, not because she wants to. The second episode, Anthology, sees an artist called Franz, who struggles to see the good in what he does. Constantly nit-picking and looking to see what is missing in the paintings, rather than what is there. He has a unique ability to, as the game describes it, peel back the layers of others, but not of his own, which results in him effectively going through havoc in his own head. Episode three, Derivation, is perhaps the most heartbreaking of all, and it pertains to something that (unfortunately) still happens to this day. Emma is a very smart and gifted mathematician, who wants to make her voice heard and allow her theories to be discussed, as she feels she might have something to give. This is all in vain, however, as sexism runs amok in what is a male-dominated field. She is set aside purely because she is female, even though she may very well be smarter than anybody else in the room. You really do feel for Emma in this episode, as she clearly has a genuine belief in her research, but because of reasons she cannot control, she is being held back in getting her thoughts out there. The fourth episode, Closure, is slightly different to the others in that it isn’t necessarily a full story about one character, but rather the episode that connects all of the stories and characters together in ways which I won’t spoil here. It was obvious to me from the outset that each of the four episodes was not completely isolated stories and it was intriguing and engaging to see how they managed to all link in the end. Before starting the fourth episode, I had my doubts as to whether many of the questions I had, would have answers. By the end, I felt a sense of relief and satisfaction that the story was over and left nothing or at least left nothing major overhanging. You do follow a different character, however, this time known as Albert, who is a journalist. I must admit that due to the nature of the episode, I never quite found the same kind of connection with Albert as I did with the previous three playable characters. There is actually very little in terms of gameplay, as I alluded to earlier. You do not have direct control over the characters; instead, you control a cursor, which is how you move your character around, examine items, objects or scenery and make different conversation selections. I am always a sucker for inspecting everything in games like these. It helps the world feel a bit more alive if done well and The Lion’s Song certainly gets it right in this aspect. There isn’t an abundance of things to inspect, which turns out to be a great choice, something that some games gets wrong, as there is a risk of having too many pointless facts scattered around the game world which can overcomplicated things needlessly. Dialogue choices are a big part of The Lion’s Song, and what makes it work well is certain things you say will alter something later in the game. We have all played games in the past that have dialogue options and it really does not matter in the slightest which you pick, as nothing is actually going to be affected because of it. Well here, it does, so it actually makes you think a little more about what you want to say. However, there are times where the dialogue trees falter somewhat and you literally have no idea what you are supposed to say, as the game does not give you any kind of clue or indication of what the correct response could be. It can be frustrating when this happens and you end up messing something up later on, which you had no idea about and in order to rectify it, you would simply have to start the game again from the moment in question. Each episode is between thirty and forty-five minutes long, which, if like me you like to explore the world fully. This means that the game takes less than three hours to complete, which doesn’t exactly sound like a lot. Nevertheless, because of the different paths the dialogue can take the story, there is some replayability in here. Sure, you might be the kind of player who will finish the game and never return and that is fine, but at least for those that could come back, there is something to come back for. The lack of touchscreen support for a game of this nature, on a console like the Nintendo Switch, is an odd choice, to say the least. Particularly as it has previously been released on touchscreen-only platforms. It makes it all the worse, as the cursor does not move all that fast. Even though this might seem like a small issue at first, the more you play the more you just wish you could make the cursor travel from one side of the screen to the other faster. Characters, like the curser, also travel slowly and I sometimes wished I had a fast-forward button in order to get my character to where I pressed the cursor faster. The look of the game is very unique, it almost looks like a slightly more up-to-date GameBoy. The limited pallet works to the game’s favour, however, as it gives the game an older sort of feel right from minute one. Even with its pixelated style and greeny-brownish colours, there are so many small details within The Lion’s Song which help further fill out a more believable world. There was one moment in particular which stood out to me and it involved the Mathematician, Emma. She opens a letter and receives some bad news, rather than the dialogue tell me she was upset, all that happened was a single teardrop fell onto the piece of paper. It was not much, but it didn’t have to be, as the visual indication of her being upset is a lot stronger than a written indication. If you enjoy a slower game with a brilliant and touching story or stories in which, to get the most out of it, you have to give it your full attention, then The Lion’s Song may very well be a game that you will love and think about for months to come. The unique art style and its attention to the smaller details only add to the intrigue. It has its problems, sure, and they do start to become a bigger issue as you progress further, but none will make you want to put the game down, as, by that point, it will already have its hooks into you.